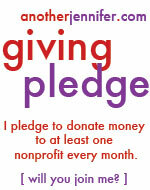 I pledge to donate money to at least one nonprofit every month. December is typically the most popular month of the year to donate money to charity. It’s the season for giving, and the last chance to get some extra tax deductions before the year ends. I get lots of donation appeal letters at the end of the year. Working with nonprofits for several years, I know it’s the best time of year to ask because people are in the giving mode. While my husband and I do give throughout the year, it’s not a lot. At least not in my mind. We certainly could do better. As we put together our information to do taxes in January, I pointed out that we didn’t donate enough money last year. We always have good intentions and even have a number of organizations we feel strong about giving to. But to be most effective, we need to spread the love out throughout the year. So, today, I am taking a public giving pledge to donate money to a different nonprofit each month. Simple as that. This strategy will allow us to give to more organizations and feel better about our philanthropic efforts at the end of the year. I will fill you in on how we do throughout the year. In January, we donated to CURE (Citizens United for Research in Epilepsy) in honor of my son’s classmate who suffers from epilepsy. You can read Calvin’s ongoing story on the blog his mom, Christy Shake, so eloquently writes. Our gift will help bring hope to the millions of Americans suffering from epilepsy. Most of us will never get on this giving pledge list, but together we can make an impact by simply designating some of our money each month to put back into our communities. So, who’s with me? Take the public pledge by leaving a comment on this post or writing about it on your blog and linking to this post. Or, grab the badge below and tell the world. What a great idea! I am going to take this pledge too!! Thanks, Jenn! A simple, but powerful way to give back, I think. This is awesome, Cathy. I find that by making my donation recipients public, it holds me more accountable to keep up my end of the Giving Pledge. I had also hoped to inspire more giving! I wrote a blog post about your pledge and mentioned you in my post! I was so excited to read about your pledge (and I uploaded your button) that I had to quickly get the word out. I’m so glad your joined my Giving Pledge, Cathy. It was a great post. Thanks! Hi Jennifer, After years of living in South Afica where my privilege by birth was so obvious and my responsibility and duty to give back became so very obvious, I give regularly; more and more often as I get older and I find that I never really miss the money … it seems to be replaced from somewhere or other or just not needed. I love being a part of http://www.b1g1.com and I can thoroughly recommend http://www.kiva.org after a good few years of recycling loaned money – it is “the loan that keeps on loaning”. I’ve promoted both to my friends and family and business associates but never really considered making a public pledge. Thanks for the prompt, that’s changing right now!